Understand the influence of your personalization and optimization efforts on revenue and conversion rate with Dynamic Yield's flexible conversion attribution. Understand the influence of personalization and optimization. The buyer’s journey in today’s fragmented marketing environment is nonlinear, and it often consists of multiple touchpoints. As a result, understanding the statistics of A/B tests and personalization campaigns, and being able to attribute conversions and revenue uplifts to specific variations, has become a huge challenge for marketers. Attribution helps us figure out if we should give credit to specific experiences or variations for revenue or conversion events. It allows us to get a better understanding of the influence of our actions on buyer decisions to ultimately serve the highest converting content. For example, take a standard A/B test. What happens if a variation is served to a user, and this user makes a purchase the next day? Should we attribute this conversion to this variation? Maybe. Maybe not. It depends on the content and context of that specific experiment. This is why moving beyond strict conversion attribution models to flexible attributions is vital to help marketers know what is truly influencing conversion to optimize accordingly. 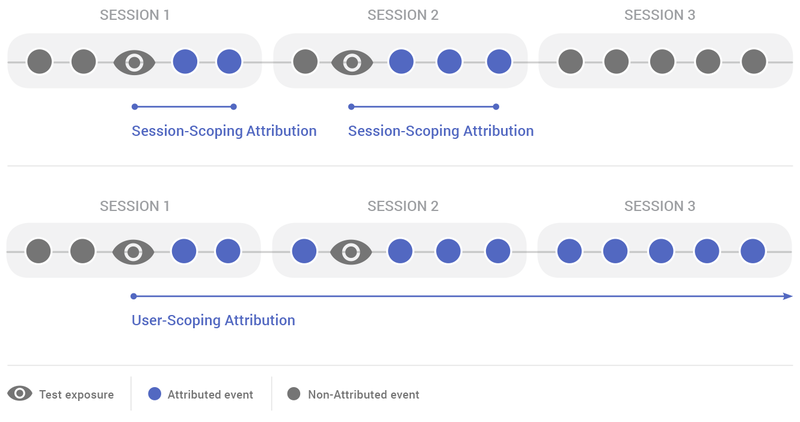 Session-Level Attribution Scoping – When a user is shown an A/B test variation or a personalized experience, all subsequent revenue and goal conversion events are only attributed to that variation if a conversion occurs in the same session. User-Level Attribution Scoping – When a user is shown an A/B test variation or a personalized experience, all subsequent revenue and goal conversion events from that user are attributed to that variation, for as long as the experience is active. Which Attribution Level Should I Use? To illustrate this further, let’s look at a common use case: triggering an overlay to get the user to subscribe to your newsletter. In order to not bombard your users with pop-ups, you are limiting the appearance of the overlay to once a week. Imagine a user visits the site on Sunday and sees this overlay. She quickly closes the overlay to continue browsing and ends the session without subscribing. 3 days later, the user returns to the site, and during the course of this session, enters her email and becomes a loyal newsletter reader. Would you really want to attribute the overlay to this subscription? Probably not. Limiting the attribution window to session will help you filter out conversions that are unrelated to the variations. Reducing this noise also means that we can reach a conclusion faster to determine what actually influenced the conversion. Now, consider the purchases of a high-value item such as a washing machine which almost always happens across multiple sessions. The user may first browse products on a website or mobile app, think about it, explore competitive offers, swing by the retail store with his wife to make sure she feels the item has sufficient je ne sais quoi and eventually come back to the website to purchase. Looking only at attribution that happened in a single session might result in low conversion counts that greatly undervalue the impact of specific personalized experiences. In this case, go with user attribution. For this reason, we are excited to announce that marketers can now set the attribution window per test to session or unlimited. We are confident that this will present our customers with a clear picture of what is working so you spend less time making sense of your data and more time deploying new experiences based on it.